It has been a long time between posts, and a long time between rides. The battery saga from Christmas just went on and on, faulty cells, faulty BMS, more faulty cells, it all got a bit dispiriting, and cells and BMS took for ages to come, including a battle with Chinese new year, raising a dispute on Paypal, online retailers refusing to honour orders until the dispute was removed, refunds and re-orders! Eventually the bits and pieces arrived, and I started building the new batteries. Then the business got in the way, and I just didn’t have the time or energy to finish them off! Easter came along, Lynn and I went for a walk along the Queen Charlotte track in the Marlborough Sounds, New Zealand, and on the last day, while having a burger while waiting for the ferry to Wellington, I picked up my rucksack and damaged a muscle in my neck. It is still not perfect, but today, 4 weeks on, I rode the e-bike for the first time in several weeks! It is still great, and I still love it, and so long as I wear my merino buff to keep my neck warm, it feels good. I also finished off the new battery build. Instead of using the same cases, I have built the batteries into a pair of panniers. 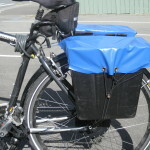 These are hard plastic panniers, which in a previous life were used by NZ Post cycling posties to carry mail. 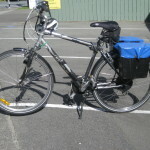 Ironically, they are no longer required, as the new postie bikes are e-bike capable, so need different panniers! I have made up a new “sling” across the top of the rack which is bolted to the panniers, to replace the rather worn and battered item that came with them. Likewise I have made some temporary lids out of plastic banner material. These will be upgraded to waterproof nylon canvas when I get round to it. 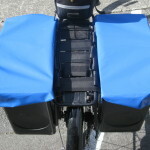 One pannier(the right) has 6 cells in it, with linking wires across the rack into the second pannier, where the second 6 cells, the BMS, power plug and charging port are located. A high ampage power lead and 45amp Anderson connectors, and a seven core cable with multi-pin connectors link the power and BMS sides of the system up. Next job, duplicate the batteries for use on Lynn’s bike. Lynn currently has an RSI problem with her thumb, and is in a plastic splint that makes riding a bike impossible, and has been for a couple of months, so she is not on the bike at the moment either! So we both missed a fair portion of the summer riding again! Still the weather is good now, so lots of good rides for me during the late autumn weather. 1 Pings/Trackbacks for "Electric bikes – back again"